Rotary Club of Gillingham, Dorset - Welcome! On November 8th we will be running our annual Race Night when the Hobby Horses compete with each other to raise funds for local good causes. Why not get together with a group of friends and make up a table of 8 or 10 or come on your own and join in with the fun. Tickets available from 01747 824663 or via the "contact" link above. We're a small, friendly, club comprising men and women from Gillingham and the surrounds. We are a part of Rotary International, which is the world's largest service organisation for business, professional and community minded people. Gillingham have 18 members who meet on a Wednesday at the Olive Bowl, each month we have speaker and invite guests. We raise money to help people and the local communities. Shake tins outside supermarkets to collect money. We participate in various sports against other Rotary Clubs, Social events are organised on a regular basis. 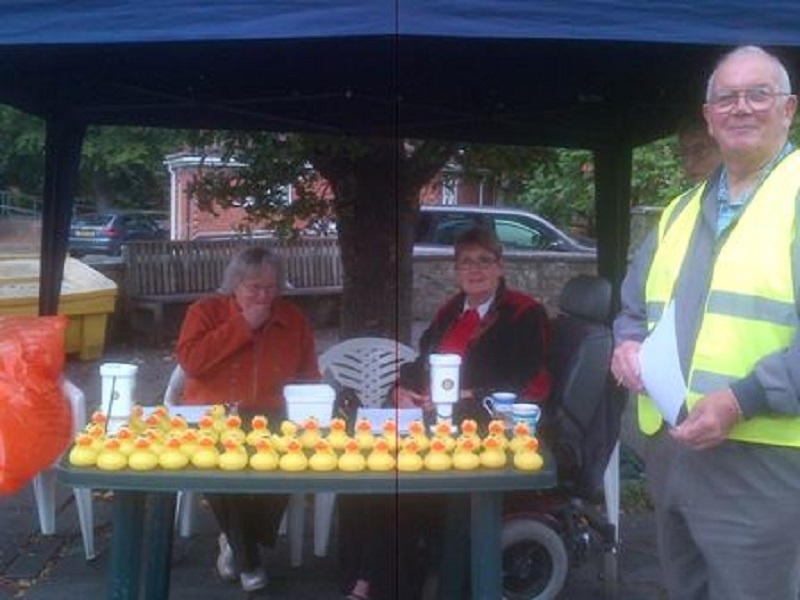 Events such as Burns Night, Duck Race, Race Night and Quiz Evenings are held to raise funds. We have many requests for help and each one is investigated before committing time and resources. Locally we have supported the Somerset Flood relief in 2014, Salisbury Hospital Stars Appeal, A local Student who worked in Africa teaching, Birthing chambers in Nepal, Shoeboxes and Tools for self Reliance. We helped young Alfie who required an operation in the USA to help improve his mobility. We support local Schools as and when required. Rotary organise Youth Competitions. Youth Speaks , Young Musician of the year, Young Photographer of the year and Young Chef of the year. Anyone who helps with or at an event organised by Rotary will be covered by our insurance. During July we gave all the year six children in the four Primary Schools in Gillingham and the Mere Primary School a copy of the “Dictionary 4 Life”. In total 167 dictionaries were given out. This is the third year we have done this and they are very well received by the children and staff. The cost of the dictionaries was covered by the various fund raising actives that have taken place during the past 12 months. In October we will again be running the Duck Races at the town bridge and the proceeds will be divided equally between the Carnival Committee, Hot Rock Carnival Club and Gillingham Rotary. We will be running the normal Christmas raffle at the Olive Bowl and in January are organising the local Burns Night. In October 2017 each of the five primary schools were given 1000 corms, Gillingham School had 5000. Gillingham Station will had1000 and members were offered corms for their own use. The Town Council planted surplus corms in the gardens on LeNeubourg Way. Bringing the Polio Plus Campaign to the attention of the people of Gillingham. Rotary were the front runners in the eradication of Polio. This started in 1984 when Polio Plus was launched and at that time there were thousands of new cases per year so far this year there have been only 22 cases reported in two countries. Rotary was started in 1905 by a Paul Harris and two of his attorney friends in Chicago. The movement slowly grew and they began helping local people. Today there are 1.2 million members in 120 Countries all linked back to Rotary International in the USA. All Rotary Clubs are organised independently. All members are Professional Business people with a commitment to helping others who are less fortunate. Shelter Box and Water Aid are just two activities started by Rotary. If you are in business in or around Gillingham and wish to help there are various ways in which this can be achieved. Please use the contact link above. Gillingham Rotary are looking for men and women of all ages and backgrounds to join us either as volunteers, members or both. You can use your time, talents, professional skills and energy to improve the lives of people in our local communities and around the world. If you wish to know more about Rotary please use the contact below. For further details please contact the Secretary at secretary@gillingham.rotary1110.org or use the "Contact us" at the top of this page. The Olive Bowl, Gillingham Events Centre, 23 Brickfields Bus Pk, New Rd Gillingham, Dorset.